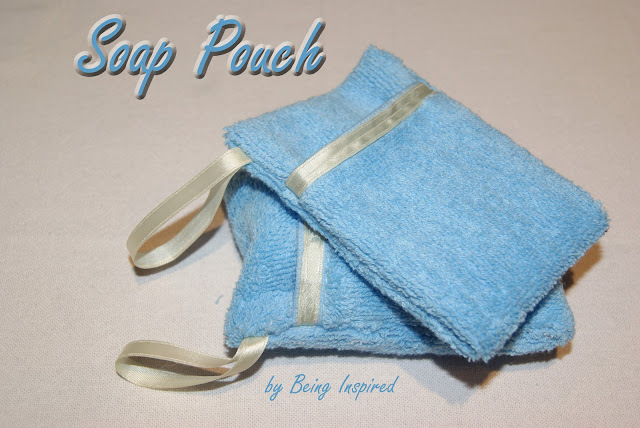 Here's a quick and easy little sewing project inspired by Whimsy Love - a little pouch for your soap! Pop your soap inside, scrub away and throw it in the washing machine to clean it! It even has a little ribbon loop so you can hang it up to dry in the shower. And the best part of all? It's so easy to make! All you need is a face cloth (or hand towel), some ribbon and a bar of soap. Cut a rectangle out of your face cloth about 4" by 11.5". Depending on the size of your soap you might need to play about with this a little, try 4.5" width if you want a little wriggle room! Lay out your material with the ribbon end face up at the bottom. Fold the bottom up to about 3.5". Cut another piece of ribbon and fold it in half. Place the loop just above the fold in your material. Make sure there's a little bit sticking out at the side! Fold the top down so that the pouch measures about 4.5" - 5". This was the first one I made and the fold actually comes down a bit too far so try and have it a little bit closer to the middle so you can get your soap in! Sew along the two long sides (where the pins are). Turn your little pouch the right way out and pop the soap inside! - Soaps come in many different sizes, play about with the measurements (or seek out some smaller soaps!) if yours doesn't fit first time. - It's definitely easier to use a face cloth, less raw edges to work with! - You know the ribbons on tops and dresses that are used to keep them on the hanger in the shop but are really annoying when you're actually wearing the clothes? Start hoarding them, they're perfect for this project! These are too cute! I love soaps!Thanks so much for sharing such a easy tutorial! Oh how cool is that!! I love soap pouches!! Yours are fabulous. Very cool! I made a crochet one, I love that this one is sewn! Love this! Super cute idea for gift giving too. Thanks so much for linking up to Creative Thursday. Can’t wait to see what you share this week! Have a wonderful week.